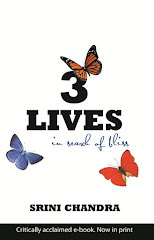 3 Lives, In Search Of Bliss, by Srini Chandra, is meant to be an inspirational story of a New York cab driver, who upon his sudden and untimely death, cries out to God in anguish. In answer, he is offered 3 chances of redemption and finding happiness -- 3 lives of his own choosing. The book is about his journey and experiences in these 3 lives, towards the final destination of attaining eternal wisdom and bliss. What starts as a journey towards wealth, health and knowledge transforms into discovery of eternal wisdom and bliss. Is life unfair? Or is it uncertain? Is life mysterious? Or is it simply beautiful? Exotic, evocative and haunting, the tale of Ray Cordoza’s 3 lives will make you ponder your own choices in the pursuit of happiness. Ray Cordoza, a New York cab driver, is murdered on his 42nd birthday. He feels that life was unfair to him while he was living, and even in his death. His last words, cried out in anguish, were "Why me?" He gets the answer to his question in an interim phase after death. A 'Voice' talks to him, and then offers him 3 lives of his own design, to seek happiness. The Catholic Ray is then born as Anwer Al Safi, a self made billionaire and the most famous Arab in the world. In his next life, he is born as Dr. Jill Clayton, a scientist and teacher at Cal Tech in Pasadena, whose husband is shot in a terrorist attack in Mumbai. And finally, he takes birth as Tenzin Lhamo, a boy monk who is forced to flee his mountain homeland to exile in India. Through his experiences in these 3 lives, he eventually finds what he was seeking. I bought this book from flipkart because it has a very high average rating by readers, both on flipkart and goodreads. I usually like reading books in the spiritual genre, but this book failed to hold my interest. Even with just 128 pages, I couldn't finish the book in one setting. Maybe it's because I've already read better books in this genre... I don't know. I'll try to give as objective a review for it as I can. First of all, the characters. Four main characters (including Ray Cordoza), plus other secondary characters, in just 128 pages. They failed to connect. The character sketches were very scanty, like the ones you see in short stories on people's blogs. Especially the monk. The way that monk was introduced in the plot gave the impression that he was going to do some really big things, but the author couldn't do justice to that first impression. Now the story. Mr. Chandra has thrown in a bit of the super-natural into the plot -- the 'Voice' that talks to Ray after his death, and later in the plot too. I personally have a strong aversion to such "stunts" by Indian authors. I hated Chetan Bhagat's One Night At The Call Center for the same reason! If you want to write something in fantasy, then make it pure fantasy, like the Harry Potter series or the Twilight series or even Enid Blyton's Enchanted Woods and Faraway Tress! Create an entire world out of your imagination -- illusionary, yes, but logically believable! Besides, an entire series on Conversations With God has already been written before! And there is also our very own Bhagvad Gita! The 'Voice', heard by Ray and his future reincarnations, didn't work for me. Coming to the philosophy or the ideas presented in the book... again, there's nothing new to take home, but then, nothing new can be written on this subject. It's only the presentation that can be changed. How convincingly, you can put across the message to your readers. 3 Lives, In Search Of Bliss, by Srini Chandra, completely failed to convince me. One moment, the character in the story is caught up in mental/emotional turmoil. Then on the next page, s/he has suddenly crossed over to the other side, in total acceptance. There is no explanation for the transitions. Experiences like that don't happen in real life. Our thinking patterns don't just suddenly change without any effort or reason. Minds have to be trained diligently to achieve the level of control and calmness that the characters in this book develop all of a sudden. Tales of such un-real and super-natural experiences actually discourage the common people from the spiritual path. What is one supposed to do... wait for his death so he can hear a Voice? In reality, the spiritual journey rarely comprises of such 'short-cuts'. For most of us, it is just a routine practice of awareness and acceptance... a life long mind-training exercise. I've never heard any 'Voice' so far, but I sure have learnt more from a few email conversations with a total stranger in the UK than I did from 3 Lives, In Search Of Bliss. My rating: 2 out of 5. 3 Lives, In Search Of Bliss, by Srini Chandra, attempts to inspire people, but it won't have a long-lasting effect. It is too far cut-off from reality. I would have given it only 1 out of 5, but it does have some good quotes that will make excellent tweets! Actually, the book would have had a greater impact if it had only been a collection of those quotes that people could meditate/reflect upon.